“Colour and design brushed by a splash of whimsy have always been touchstones of my work. Primarily a colourist, I prefer the juxtaposition of shape and pigment to that of light and shadow. My paintings use stylized images known for their colourful pigment, sense of playfulness and the use of outlined shapes, together creating an image reminiscent of mosaics or stained glass. An Orillia based watercolour artist, Prudence Smith obtained a BA at the University of Toronto followed by a diploma in Child Study leading to the Child Life Department in the Hospital for Sick Children. The serendipity of a summer art course rekindled a childhood attraction to paint and paper. Over the past 25 years her unique style has primarily evolved along a path of self-discovery. For the past 25 years Smith has exhibited in many solo and group shows in central Ontario. She has been represented by Perivale Gallery, Spring Bay, Manitoulin Island since 1994. 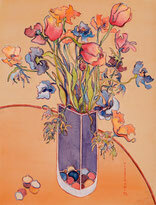 Her warm and lively paintings are in private and corporate collections in North America, Europe and Asia. In addition to her original work, many of the images are also available in card stock.